When you’re ready to hit the slopes, you’ll need the proper equipment to carry your gear. 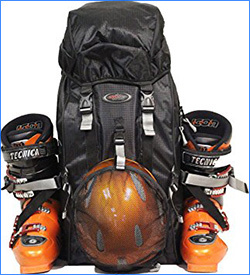 A ski boot bag is useful for carrying ski boots and other small related gear. The best ski boot bags are durable, comfortable to wear, and large enough to accommodate your boots along with a couple other items. Some factors to consider include the material, zipper quality, number of compartments, and strap padding. Below, we’ve chosen the top 10 best boot bags based on the above criteria. This table displays the top 5 best bags and compares them based on a few important factors, like price and rating. This boot bag from Select Sportbags is unique in that it carries your boots and helmet externally rather than in internal compartments. This allows for plenty of room inside for other gear. With everything packed, it’s quite large, but it’s relatively lightweight. It also prevents boots from getting the inside of your bag wet. 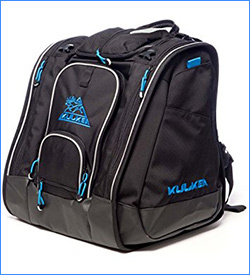 The Kulkea ski bag is pricier than some of the others on this list, but it’s spacious, durable, and comfortable to carry. The bag comes in 5 different colors and can fit boots up to a men’s size 13. It includes a large gear compartment, two side boot pockets, and small additional pockets on the front and top for other items. This bag is made from water-resistant material. The Deluxe Trapezoid is affordable and well-reviewed. It’s spacious enough to fit everything you need, and it’s also sturdy enough to withstand being handled during flights. It’s solid, well-padded, and well-made. 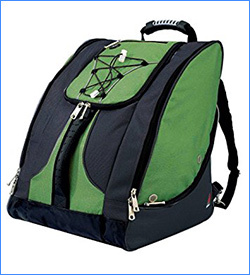 Has padded shoulder straps and a grab handle. 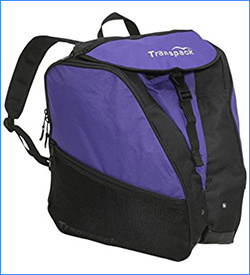 The XTW bag from Transpack is compact enough to fit in the overhead bin of most planes, so it’s great for carrying your gear along on a far-away trip. However, its compact size can also be a con for some people: it’s not as spacious inside as some other boot bags. This bag is designed for women and comes in a wide array of fun colors. It’s comfortable and well-made. The ski bag and boot bag combination from High Sierra is sometimes sold out online, but you can’t get a much better deal than this. 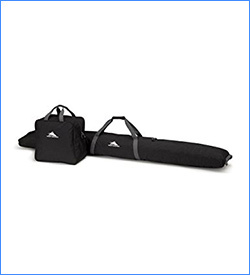 It includes both a roomy ski boot bag and a bag for your skis at a low, affordable price. It uses water-resistant fabric, and the boot bag can hold boots up to size 13. The boot bag itself isn’t too fancy, but it’s great for carrying your beginner skis. The National Team tri-pack comes with 7 compartments per total: a large one to hold your gear, two side compartments for boots, and four small side pockets for tools and wax. This bag can hold boots up to size 13, and it includes a back panel to distribute weight evenly on your back and shoulders. 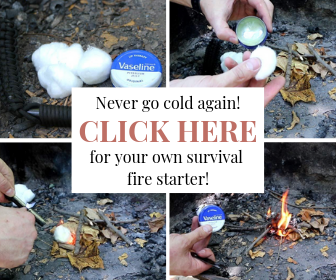 It’s well-padded, cold crack proof and spacious enough for everything you need. The Everything boot pack from Athalon is packed with features like bungee cords and an MP3 pocket with a hole for your earphones. It has a spacious main compartment with side compartments for your boots, and it’s padded with four lumbar back pads. 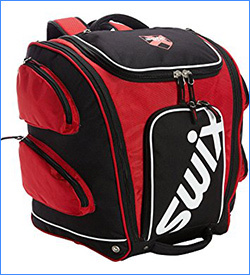 This bag doesn’t have as many compartments as some others, but it comes in a variety of colors and is spacious and well-organized. 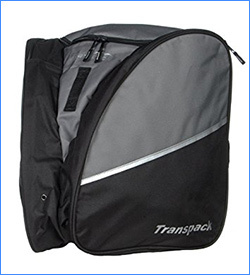 The Edge Isosceles bag from Transpack is great for shorter ski trips since it’s spacious but not overly so. It’s durable and well-constructed, and users say it’s pretty comfortable even though it doesn’t have any padding on the back panel. It includes a large gear compartment, boot compartments, a pocket on the top and an internal zippered pocket. 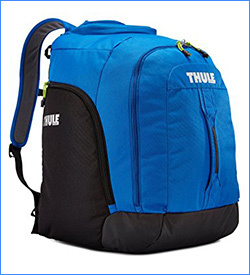 This Roundtrip bag from Thule has one unique feature: the back-panel access door flips down and can be used as a mat to change into your boots. This bag also comes with other useful features, like a crush-proof compartment for delicate items and side pockets. 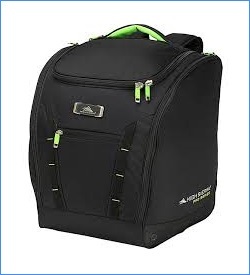 It’s on the large side, so it’s great for longer trips or fitting a bit more gear into one bag. The XT1 boot bag is compact yet spacious. Some users say it wasn’t large enough to hold everything they needed, but if you’re going on an average-length trip and just need to pack the essentials, this bag is absolutely ideal. It’s comfortable, reasonably priced and comes in several different colors. 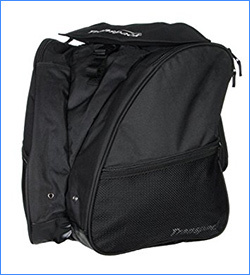 This bag is made out of a water-resistant polyester and has multiple internal and external compartments. These 10 best boot bags are comfortable and durable. They’ll make it much easier for you to get to the mountain and back. 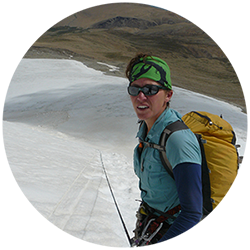 They come in many different colors and styles, also, any ski boot bag contains a large compartment for your boots, and they usually contain a couple side pockets too, designed to be carried on the back or over the shoulder. If you’ve used any of these 10 best boot bags, or have a best ski boot bag you’d like to recommend, let us know in the comments below!